Tomorrow is Halloween, or as my son has been calling it “Punkin Day”. 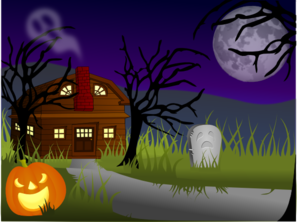 It’s every year around this time the scary movies and haunted houses show up, and people flock to them, many times paying to be scared. Honestly, I don’t get it. I don’t like being afraid. Maybe (and it’s confession time here.) it’s because I believe in Ghosts, demons, and other paranormal things. Or maybe it’s the death and gore that bother me. I can’t even watch TV shows that I used to love like CSI,Cold Case, and Bones due to the death and gore. The trailers to movies like Annabelle are enough to fill me with fear, weirdly enough I am still a highly dedicated and loving fan of AMC’s “The Walking Dead”, but Zombieland scared me? I will be the first to admit that I am a bit odd, and I am totally ready for the Zombie Apocalypse should it come. Do you watch horror movies or go to haunted houses? Do you stay away? Why? Hi April, have my 14 year old off on half term this week, shes at that age now that wont probably go trick or treating as her friends are away and naturally wont go on her own, but we enjoy Halloween. Im with you though in that I don't like the blood and gore although today we decided to watch a scary movie...Oh I was scared...lets hope I sleep tonight! I don't like the haunted, scary part of Halloween either. I believe in God, angels, Satan and demons so that also weighs in on my decision. I do like the fun parts of Halloween: dressing up, carving pumpkins, eating candy. I'm looking forward to Thanksgiving and Christmas but not the snow. Have a great holiday.